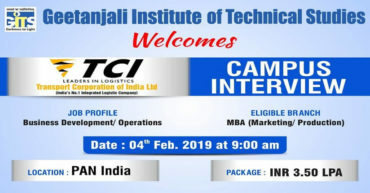 Campus Interview of Transport Corporation of India Limited for MBA (Marketing/ Production) Batch 2019. 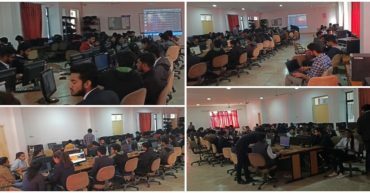 Department of CSE had successfully organized a National Workshop on Web Development Using Python Django. 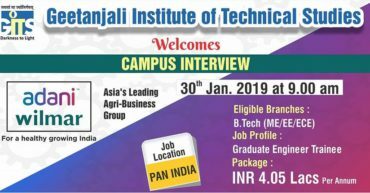 CAMPUS INTERVIEW OF ADANI WILMAR LTD.
Campus Interview of Adani Wilmar Ltd. for GITS B.Tech Mechanical , Electrical & Electronics 2019 Batch. 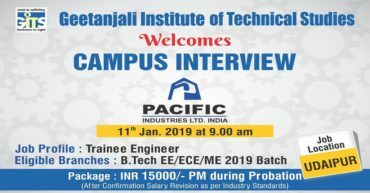 CAMPUS INTERVIEW OF PACIFIC INDUSTRIES LTD.
Campus Interview of Pacific Industries Ltd. for the Profile of Trainee Engineer. 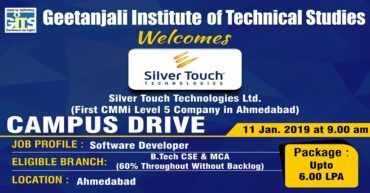 CAMPUS DRIVE OF SILVER TOUCH TECHNOLOGIES LTD.
Campus Drive of Silver Touch Technologies LTD. for our B.Tech CSE & MCA Students for the Profile of Software Developer. CAMPUS DRIVE OF SYNOVERGE TECHNOLOGIES PVT. LTD.
Campus Drive of Synoverge Technologies Pvt. Ltd. for B.Tech CSE & MCA students for the profile of Associate Software Engineer.